So Happy I met You! 2009 has been a crazy year for me. A lot changed in my personal life and I had the chance of working with new amazing people. I spent more time on the go than at home but this gave me the opportunity of meeting many of you face to face in the real world…and this, for me, it’s priceless. Invite others, friends, colleagues to subscribe and join the conversation. Word of mouth. Tell a friend. Subscribe via RSS. You’ll get all the blog posts delivered directly to your RSS reader. Fast & easy! If you like old-school but still reliable email news-letters, insert your email address here. Or get the the Live Communications Juice via RSS. You’ll get in real time all (but only) the items that I release periodically in my report. If we didn’t see in 2009 I really hope we’ll meet in 2010! Author Andrea VascellariPosted on January 8, 2010 Categories General10 Comments on So Happy I met You! I wrote this post for ‘non-geek’ people/teams. The following data can be extracted also using Twitter API etc. Not every team/organization is lucky enough to have great developers on board and sometimes there’s no time to find/outsource/hire some. So my aim was to give the possibility to ‘average’ managers to get relevant data to use in their analysis by using free and easy to use tools. Your contributions are more than welcome so if you want to share in the comments how to do it with API, other scripts etc. go ahead! In this post I’ll keep it simple for everyone. The Twitter Lists feature is a way to organize the people, brands or whoever else you are following on twitter. What’s interesting about Twitter Lists is that they represent something more than a simple tool to organize contacts. In Twitter Lists we can find a huge amount of data that can be analyzed to understand how people identify with a specific brand. So no problem, you’ll be able to complete this tutorial without specific programming skills 🙂 . 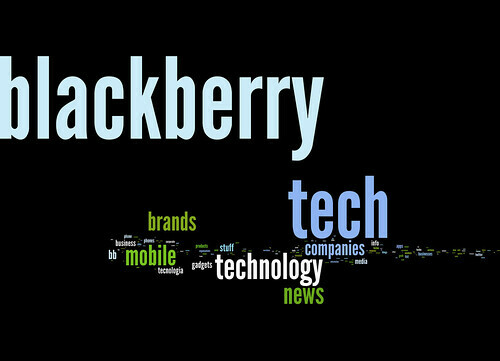 In this post I’ll use as an example BlackBerry (RIM), a brand that I follow and that I’m interested in. If you don’t have/know which brand to analyze, try with your own twitter account and analyze your ‘personal brand’! To complete this tutorial: Between 15 and 30 min. It depends about the level of confidence you have with the listed tools and about the number of lists you have to process. To repeat and perform again this process after the tutorial: For me it took 15 min. to process 1446 Twitter Lists. You can get it done faster with less lists. 1) Download and install Skim. It’s free and you can get it here http://skim-app.sourceforge.net. 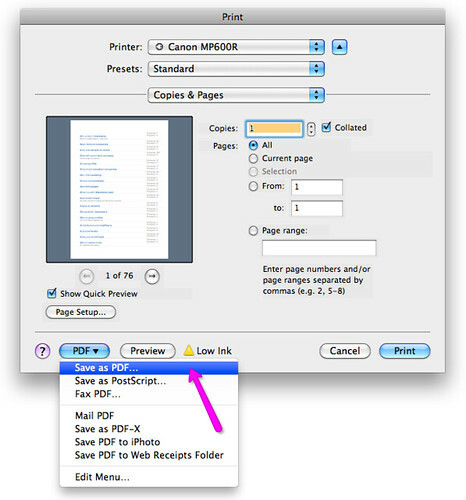 Skim is a PDF viewer. It’s scriptable and it also features an AppleScript command to extract the text from certain PDF pages, that’s why we need it. 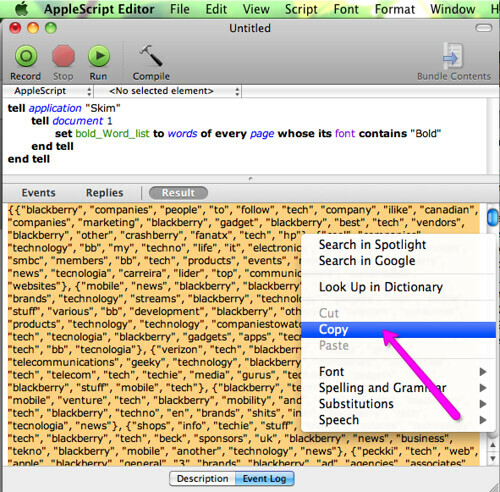 With AppleScript, we can write a script (which is essentially a set of instructions) to perform tasks within the existing applications on your Mac or within the operating system itself. 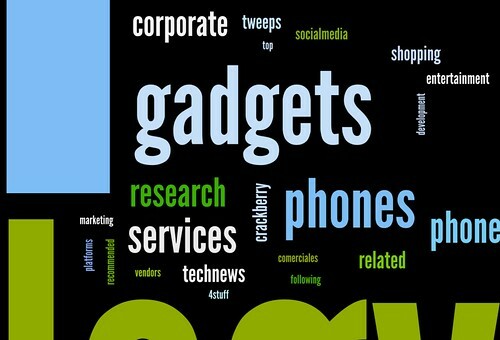 Visit the twitter account of the brand you want to analyze. I’m my case http://twitter.com/BlackBerry (but it could be http://twitter.com/vascellari if I wanted to analyze my ‘personal brand’). Go to the Lists that are following your brand. Extract the data from the page by selecting and copying all the lists on the page. Remember: If the brand you are analyzing is followed by a big number of lists (like in my case), before selecting and copying (as mentioned above) you might want to click on the ‘More’ button at the bottom of the page. Keep clicking till when the page will display the entire/desired number of lists. I this example I analyze 1446 lists (72 clicks to display them all. No worries, you can do that in a couple of minutes 😉 ). You can do this by pasting the data you copied from the twitter page on a Microsoft Word or a TextEdit document (TextEdit is a free text editor software that comes with your Mac. PCs have similar tools too). Important: make sure you maintain the blod fonts when you paste! So now we have a PDF file that contains all the data we got from the Twitter Lists. Good but certainly not enough. What we want to do next is to extract from that PDF only the name of the lists. That’s what’s relevant for our analysis. Why? Because the name of the lists are a good and direct indicator of how people identify with our brand. You probably noticed that the name of each list is blod. What we are going to do now is extracting the blod text from our PDF file. 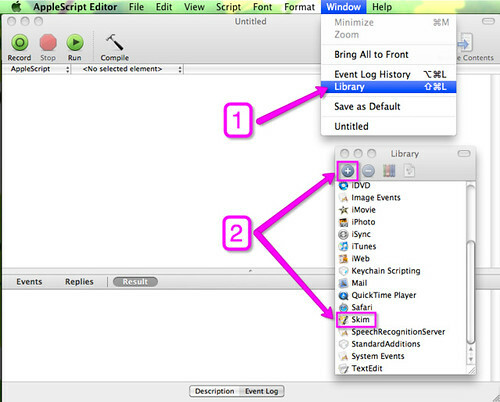 Open with Skim (Skim: remember the application you installed at the beginning of this tutorial? 🙂 ) the PDF file that contains our twitter lists data (Then leave Skim open and move to the next point). 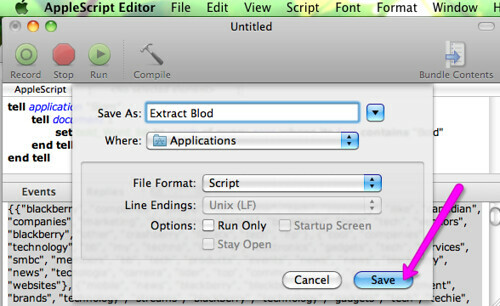 1) Copy the following script that I already prepared for you and paste it into the AppleScript Editor. set bold_Word_list to words of every page whose its font contains "Bold"
Save your script so you’ll be able to use it again in future. 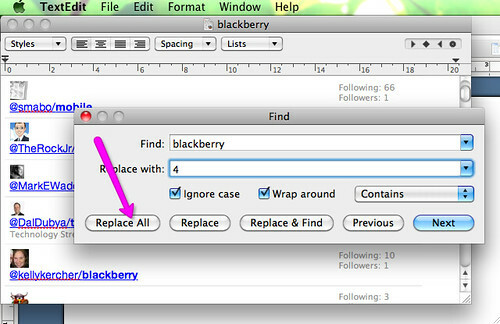 It will show up among your applications in your Mac. 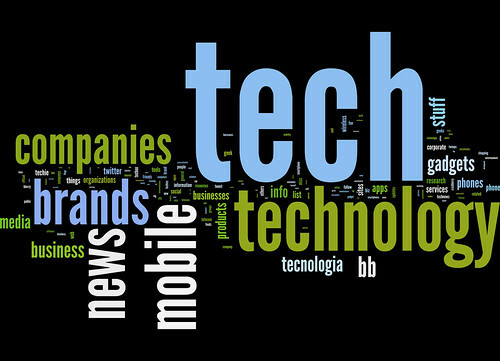 Wordle is a tool for generating “word clouds” from text that you provide. The clouds give greater prominence to words that appear more frequently in the source text. If you want a more detailed statistical analysis like the frequency of individual words, number of unique words, average number of words, etc. 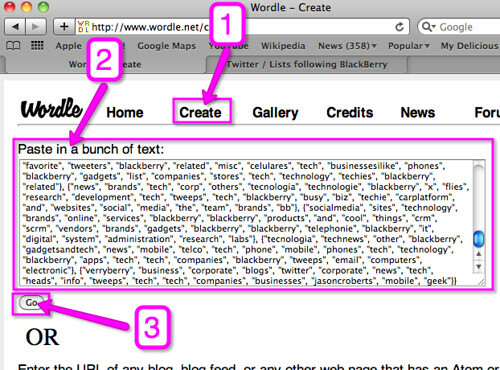 you can use any text content analyzer. Here’s a free one. Indeed, if you are a wizard of Visual Basic or a master of Marcos… please go ahead and share your tips in the comments or on your blog! Just don’t forget to link back to this post or letting me know about it 🙂 Other people might find it useful!). 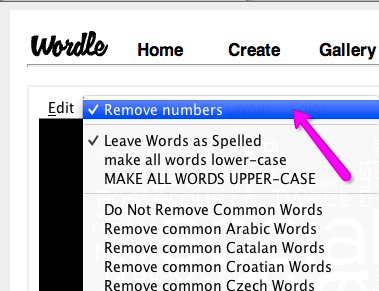 This tutorial guide would end here if you processed just few hundreds keywords but in my case I had 1446 lists to take care of so the result I got is good but I definitely have to pitch it more to get the best out of it. The main problem, that I’m sure many of you already spotted, is that probably lots of people saved BlackBerry’s twitter account in their lists as ‘BlackBerry’…hehh well I agree this is not surprising, but we have to deal with it. – The good side of it: We understand that lost of people identify with BlackBerry. This is positive. If the most prominent keyword in our cloud was ‘Phones’ or some other general one, this would probably mean that people see BlackBerry as simply one of the many devices they can get. It’s simple. Repeat the previous steps but before creating the PDF find the most prominent list/data you want to exclude and replace it with a number. 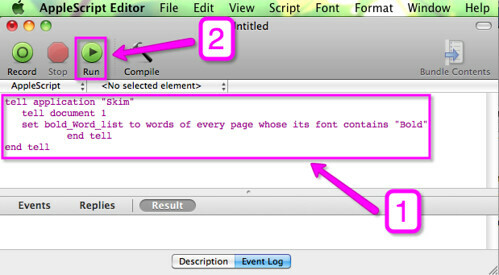 (To find a specific keyword in your text editor on Mac, click CMD+F or from the menu ‘Edit’>’Find’). The result is much different than the previous one. You can see that other elements start to emerge from our cloud giving us more inputs to analyze. Remember: Again, I used BlackBerry as an example and I certainly didn’t go deep into analyzing our results. Every communicator knows that the real work starts from this point on. Analysis change from brand to brand and most importantly are usually related to your strategic communications plan. I hope you found this post interesting and I hope it will help you and your teams in doing a better job by having an ‘active’ social media approach rather then a ‘passive’ use. All this is nothing without a plan! Please keep it in mind. Communications Planning Guide: A step by step road map that will help in crafting your plans at strategic and tactical level. Communications Plan: Strategy & Tactics: Helps you in understanding the difference between strategy and tactics. Way to many people still confuse or mix the two. 7 New Marketing Tips for your Organization: What new marketing does and why it works. List of basic tips that you can take into action in your business/organization. What would would you add to this guide? Share your experience, suggestions and tips! As usual via Twitter (@vascellari), Friendfeed, or other channels too, just remember to link back to this post!